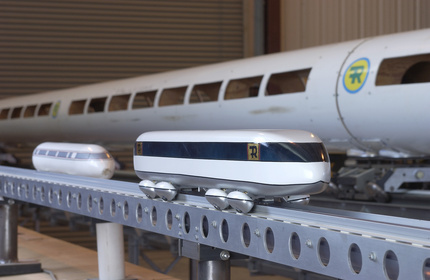 ​Flight Rail Corp. started developing the VECTORR system a number of years ago in Mendocino County, California. Engineering and design work has been performed in-house, and the company is self-financed. The effort has been led by Max P. Schlienger, P.E.. Previously, Mr. Schlienger was the founder of Retech, which was acquired by Lockheed in 1995 and is now owned by SECO/Warwick. As the CEO of Retech, Mr. Schlienger built the company into the leading designer and manufacturer of vacuum-and-inert-atmosphere metallurgical processing equipment used for the melting, refining, and casting of a wide variety of high-performance materials related to the aerospace, nuclear, gas turbine, and powder metallurgical industries. In addition to the U.S. patents of Flight Rail Corp., Mr. Schlienger is the recipient of 30 patents relating to vacuum metallurgical processing equipment for melting, refining, and casting of high-performance materials for aerospace, nuclear, and other applications requiring metallurgical materials. He is also the recipient of patents related to the thermal (plasma) treatment of highly toxic and nuclear waste. Mr. Schlienger has received a number of awards for his industry achievements, including: the Titanium Achievement Award, 2012 - International Titanium Association; Fellow of ASM, 1995 - ASM International; U.S. Small Business Person of the Year, 1995 - Presented by President Clinton; Small Business Person of the Year Award, 1995 - U.S. Small Business Administration, San Francisco District. Please submit a contact form is you are interested in staying in touch. Please visit our downloads page for detailed information about our progress, including a simple one-sheet on the program.